Rim seaport, Washington is a place where the world’s cuisines cross-pollinate in all sorts of creative and delicious dishes. Whether one seeks unique local flavors or exotic international cuisines, Washington State offers a diverse menu to delight both the discriminating gourmand and the down-to-earth foodie. Fill in the form below and we'll send you an email with all our current deals for Washington. 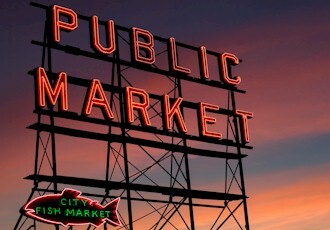 Pike Place Market Tour With Pacific Northwest Dining! Local Chefs and cooking instructors are brought in to demonstrate cooking classes. Classes are designed to make cooking fun and enjoyable. A Chef’s Kitchen cooking classes offer students the opportunity to learn in a home setting. Most classes will be demonstration-style with a teacher showing you how to prepare an entire menu during a class session. Other sessions will be hands-on and give students and opportunity to participate in menu preparation. For a treat close to home, celebrate a special event with family and friends in your own dining room. Let Bertrand guide your guests in preparing an authentic French meal with one of his distinctive Cooking Parties. At Bon Vivant School of Cooking we offer you the creative opportunity to design your culinary experience at your own pace. Classes are geared toward quality, continuity and the joy of people sharing fine cuisine. Chef Party! provides a unique culinary experience for the Greater Seattle area. We bring our passion for food into your home and give you the option of “taking the night off”, or actively participating in the cooperative creation of your meal! Personal Chef Robert Moore is teaching classes by appointment in the privacy of your home. You and your guests can learn how to prepare a four-course dinner with foods from the country of your choice. Soup, salad, main entrée and dessert. Join Mary Ellen for a creative and enjoyable time in her home while we prepare and enjoy a lovely meal, paired with conversation and laughs. Classes are "hands-on" and will appeal to everyone regardless of the level of skill. Our cooking classes are informal, fun and designed to educate not intimidate. So step into our kitchen with Chef Christine Keff you’ll soon be cooking those Flying Fish favorites at your house. NuCulinary offers small public and private cooking classes in the greater Seattle, WA area for a more intimate, interactive, and delicious experience. Let us teach you new recipes and innovative ways of preparing meals that nourish and nurture. Regional cooking is highlighted in our round-the-world classes, featuring everything from Italian and Thai, to Greek and Indian. A potpourri of fun classes from meal planning to how to sharpen your knife skills. You never know what could show up here! At Silver Table Cooking, our Kid’s Classes are competitively priced and offer a terrific value with cooking classes that last a full five hours. Kids learn basic cooking along with other advanced culinary skills in a hands-on setting that emphasizes teamwork and nutritional concepts. Unleash your creativity! Upgrade your cooking skills with a foundation of great cooking techniques, skills and an understanding of the cooking process, and become a more successful cook. Attend classes, schedule a party for friends, or a team building event for colleagues — we make cooking FUN! Sur La Table's cooking programs provide the opportunity for you to become a celebrity in your own kitchen. Instructors include each region's best-known as well as internationally renowned chefs willing to share their secrets. In addition to tasting fine beers, spirits and wines, guests can attend seminars and purchase bottles of their favorite drinks. Come EAT * RACE * ENJOY! Food samples, cooking demonstrations by chefs from all over the country. The oldest Festival in WA State with Apple Blossom Run, art & crafts, apple pie eating contest, carnival, apple pie & dessert bake-off & more. Come to the Tri-Cities Craft Beer Festival to learn more from our expert brewers while you drink beer from the source and eat local food. A weekend festival located in the heart of Brinnon celebrating Hood Canal Spot Shrimp and other local seafood. Events include a chuck wagon cook-off and feed, mule & donkey show and competition, beer & wine garden, collectible show, and parade. Live music, a Dutch Oven gathering, camping, workshops, dancing, and delicious food. Grand parade, road run, music, strawberry shortcake, salmon BBQ, Berry Cool Car Show and fireworks. Sample more than 350 beers from 100 Washington breweries. This Garlic Olympics of Gastronomy is not held for the region's Garlic growing ability--it was born out of love of great, Garlic laden cuisine! Features regional restaurants and food companies with entertainment for the whole family. WA grown fruits,vegies, eggs, cheese & dairy, local meats & poultry, wild salmon, artisan breads & pastries, jams, spreads & honey Every Sun. A unique culinary event showcasing the creative talents of visionary chefs from around the country & highlight the flavors of the great NW. SIB Is An Over The Top Beer Festival celebrating the world”s most legendary brewing styles and the nations that made them famous. Feed your inner Viking! Entertainment, beer & wine gardens, lutefisk eating contest, and incredible alder smoked salmon barbeque. Offering fine NW wines, cooking demos, spirited grill-offs, local art, and live music. Kick back & enjoy the panoramic mountain and city views. An afternoon of fine wine and local food specialties. Experience a traditional Hawaiian festival featuring a hula competition, arts and crafts, Hawaiian food, and entertainment. Take home lots of our local blueberries and sample what our country cooks can do with them. The Snohomish Hard Cider Festival features cider makers from around the Pacific Northwest. Food, arts & crafts, commercial booths, rides, a children's area, four stages of entertainment, along with beer and wine gardens. Three days of wine and food paired with fine art and craft vendors, international music acts. A celebration of everything garlic, along with crafts and arts, garlic themed cuisine, antiques, chef demos, wine tasting & beer garden. Showcases delicious spirits and beers from Lacey, WA’s regional wineries and microbreweries, cuisine from local restaurants, bakeries and cafes.